The Mana Contemporary could very well be Journal Square's best kept secret. From the outside in it's current condition one would assume it's just another one of Jersey City's abandoned warehouses from it's gritty masonry work to it's antiqued metal mesh insert glass pane windows. The exterior has been left virtually unaltered with no kind of signage that it would suggest it to be one of the city's most influential museums. Behind it's doors houses many great art pieces of our time ie. Meier, Lichtenstein, Kaminsky, Hilger etc. This hidden gem is just minutes away from the Journal Square path station tucked deep under an intricate roadway network just west of Tonnelle Avenue adjacent to the Pulaski Skyway. The gallery and storage space for all the pieces in the Richard Meier Model Museum are managed under the Mana Contemporary. What was once a bustling Jersey City Tobacco factory originally built in the 1890s; the Mana Contemporary had taken over the Journal Square space in addition to their recently acquired space in Chicago and Miami. The Mana Contemporary is a massive one million square foot space consisting of artist working studios, storage facilities and also Mana's own gallery staff. It was recently gutted and renovated to house it's many exhibitions while retaining its industrial concrete floors and factory era sized columns. As seen from Newark Avenue initially arriving at the site the existing masonry smoke stacks and wide clearance loading docks indicate the buildings age along with its past life in Jersey City. In addition to the unrestored exterior masonry work the existing freight elevator has also been converted as a main elevator for the musuem's visitors ( Yes, it has those cool vertical sliding doors that requires all manual operation). I didn't get a chance to visit their special "tick tock" exhibit in building's converted boiler room; however with the limited sunlight for the day I decided to spend all of it at the Meier Model Museum. For those familiar with Meier's work they can come to expect white handmade models crafted to "OCD" levels of perfection with the utmost detail. Most of the pieces are of Meier's most famous project the Getty Museum in Los Angeles. If you've ever been stuck in traffic on the 405 it's pretty certain you've seen the Getty up among the Santa Monica Mountains. As one of Meier's largest scale projects you'll find a massive eighth scale model of the entire project site consisting of twenty separate jig saw type pieces on metal stands and rolling wheels. It's required to constantly dissemble by shuffling the many jig saw pieces back and forth in order to properly clean and maintain the model. Upon our visit we were greeted by the tour guide who also happened to be an archivist at Meier's Manhattan office. She gave us a brief lecture on how all the models where transported sideways to fit inside the moving trucks and the gallery's relentless effort to constantly keep all the pieces dust free. The models on display date back to the 1960's some of which have been restored for exhibition while others showed their age through their ( once white ) yellowing material. Although it might not be up to the museum standards I found the patina on these older models with tiny errors here and there to have much more character than the other perfect white models. It helped me gain some real perspective that all these models are indeed handmade! 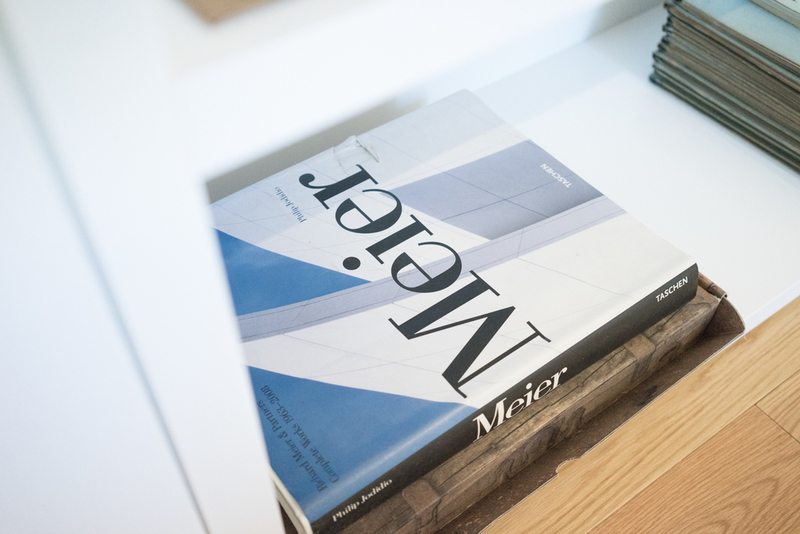 The exhibition space which also serves as the firm's model storage was designed exclusively by Richard Meier himself in addition to a small library area in a hidden part of the museum ( a perfect nook for a whole afternoon of delightful reading ). Admission is completely free for the whole museum ( thanks to all the generous supporters of the Mana ) you just have to call to schedule an appointment with Mana's staff. It's quite a large museum with multiple floors so allocate a couple hours to hit all the exhibitions. If you do get the chance be sure to stop by Ann Meier's ( Daughter of Richard Meier ) furniture gallery which is directly adjacent to the model museum. The Richard Meier Model Museum offers tours for individuals and groups by appointment Monday-Friday between the hours of 10:00AM to 5:00PM. To schedule your visit, please contact m.museum@richardmeier.com. Advance reservations for appointments are required. Tours run approximately 45 minutes and are led by the firm’s Archivist. Please let us know how many people will be in your group and if your group has a particular interest or focus for your visit.